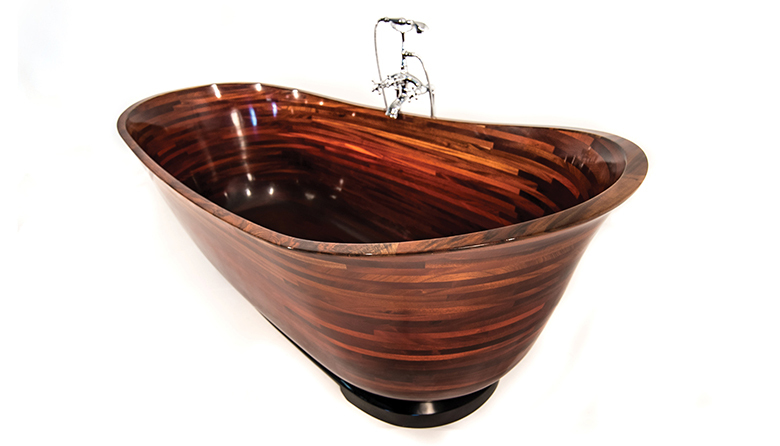 NK Woodworking’s $30,000 wooden bathtub is so stunning that Seattle magazine’s March 2018 article about it accumulated more than 320,000 views in just a handful of days (and thanks to the magic of the internet, it continues to regularly top our best performing stories). We thought we’d check in with founder and owner Nathie Katzoff to see how business is going one year after all the buzz first rolled in. Business is good, Katzoff says: orders for his bathtubs are about the same as last year (with his staff of 25, who also craft custom staircases and other bespoke wood installations, the company sells about one or two a month, each one taking three to four months to build). While there hasn't been a noticeable rise in demand for the tubs, Katzoff says clients such as the Kardashians, and having one of his tubs featured in a video with the Sheikh of the United Arab Emirates, has kept interest in his products and services very steady. So what’s new? Katzoff says that in addition to its custom work, the company is working on developing a line of ready made furniture. “We started making [tables, chairs and other furniture] that were so cool that we wanted to repeat it.” If the pieces look anything like those tubs, each will be its own handcrafted work of art—and maybe the next viral hit.